In early November, 2014 TDS began to hear from people in Massachusetts that they were receiving phone calls from someone with a foreign accent named “Steve Martin” who claimed to be a U.S. Treasury Agent calling about back taxes and penalties. The agent was threatening legal action unless the person agreed to immediately pay the back taxes over the phone. We’re certain the caller is not this Steve Martin. Soon after hearing about this scam, we got home and were thrilled to hear that we received the same scam! 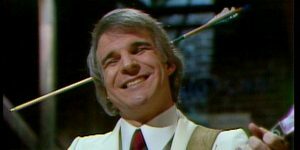 And “Steve Martin” left us his message on our answering machine….twice! Does he sound like a Treasury Agent to you? Click the audio file above and listen. “…enforcement actions executed by you…” What does this even mean? Just hang up…After having a good laugh. Click here to visit our more recent IRS Phone Scams! Also click to read about tax scams during tax season! Check out the scam call from the Cyber Crime Investigation Department!